Last winter, I wore the same snow boots every time I left my house for almost seven months. Minnesota, in the grip of a historically severe winter, was shellacked in several feet of snow from November to April—the kind of snow that doesn’t melt, but rather petrifies, growing yellow with the urine of dogs and drunks and sprouting a crust of cigarette butts and aluminum pull tabs. The kind of snow that requires not just snow boots, but a certain kind of Lutheran forbearance, to endure. I had finished graduate school the previous spring and was staying in the Midwest and trying to write, but mostly failing. Instead of writing, I was watching television. Sometimes I took breaks from the television to Google Reporting neighbors for not shoveling sidewalks—Minneapolis. For weeks on end I passed the same puddle of frozen vomit on the sidewalk, walking to the co-op in my neighborhood to buy hothouse vegetables and peaches of a baseball’s firmness that would never soften, flown in from some place where they’ve never heard of microwavable socks and only use rock salt for the making of ice cream. I was, you might say, in a bad way. 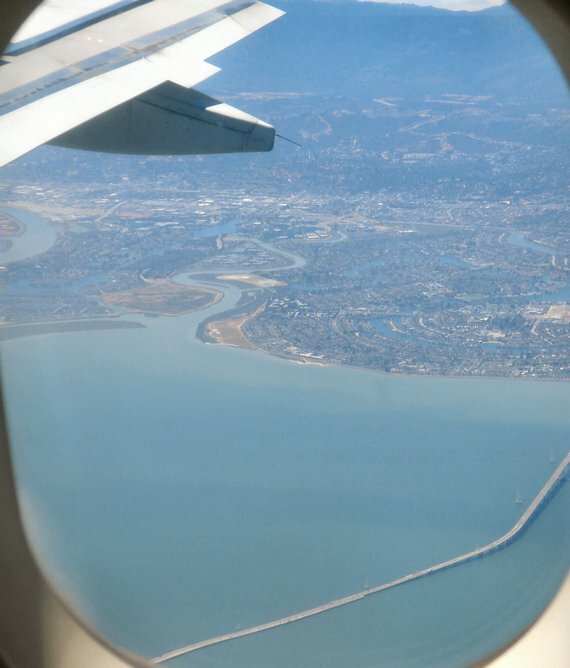 In April, I went out to San Francisco for five days, my first real vacation in several years. I flew to the west coast to visit a few friends, with the idea in the back of my head that if I liked it, I’d think about making a move. Let me pause here to say that I am not sure what it is in my past that has convinced me I’m a levelheaded and methodical person, not prone to following impulse. It’s one of the bigger of my self-delusions. I should have guessed what would happen when I got to California—I didn’t think about money or employment or the kind of support system I might have if I moved to a state after spending less than a week there. I didn’t make a budget or research apartment rentals or neighborhoods. I just walked out of the baggage claim at the San Francisco airport and thought, without hesitation, Yes. By the time my friend arrived in a ‘94 Toyota Corolla with a sheet of Plexiglass welded over the top (a reveler had stomped through her sunroof after the Giants won the World Series), I was deep in the kind of mental acrobatics necessary to consider lifting up my life and resettling it, 2,000 miles away. If there’s ever a time in your life to read early Joan Didion, it’s when you’re young and thoroughly disenchanted with a place. As it happens, I brought Slouching Towards Bethlehem with me on my trip to California, and I read “Goodbye to All That” on the flight. The essay—which is a good deal about New York, but a greater deal about how it feels to become so thoroughly sick of the circumstances of your life that you lose all ability to imagine something better, something easier, any change at all—did not make any lasting impression on me as I crossed the continent. I had a deep appreciation of certain sentences, but that was all. I didn’t yet recognize myself in Didion’s rueful description of her own younger self; I was too caught up in the excitement of a trip and long-missed friends and warm(ish) weather. It was only later, when I had handed my heart over to fog and tiers of cheerfully mismatched houses and the dumplings at a certain restaurant not far from the ocean, and was back in my cold and spare Midwestern apartment, that Didion’s prose began to seem like a beacon. It’s funny how, if you’re a reader of any degree, you sometimes come across the exact right text at the exact right time. It has happened for me once or twice before—Eva Hoffman’s Lost in Translation at a moment when I could not understand why no place seemed to feel like home any longer; Lydia Davis’s The End of the Story in the middle of a breakup that wouldn’t take. Of all the books I could have picked up for my San Francisco trip (the unread story collection I was meant to review for the Minneapolis Star-Tribune, the perpetually half-read Madame Bovary), I chose Bethlehem on a kind of premonition, seeing it on the shelf in a neighbor’s apartment. Wasn’t Didion Californian? was all the thought I gave it. As easily as that, I had a thing I hadn’t known I needed. There Didion was in my ear, telling the story of how New York had ended for her, and showing me, with the gentle brutality of a certain kind of mother, how Minneapolis had ended for me as well. For the next few months, Didion’s images lingered: gold silk curtains, the scent of crab boil, a cockroach on the tiled floor of a bar during the moon landing. I thought of those scenes as I packed my books and linens into boxes. I thought of how I would think about the Midwest, once I had gotten out of it. I was in love with the city, the way you love the first person who ever touches you and you never love anyone quite that way again. I remember walking across 62nd Street one twilight that first spring, or the second spring, they were all alike for a while. I was late to meet someone but I stopped at Lexington Avenue and bought a peach and stood on the corner eating it and knew that I had come out of the West and reached the mirage. I knew that mirage. I encountered it first when I arrived in the Minnesota, on a crisp and clear late summer day (the kind I know, now, that there are only three or four of per year), and saw my new neighborhood, with its rows of cottages and little bungalows all shivering when the train passed through. I loved my house, my walk to campus, the old grain elevator overlooking the park on the corner and the generally bygone feel of the whole region. In winter I loved watching children ice skate and the sound of snow plows late at night passing my bedroom window. Later, when I moved to a seedier part of town, I loved that too: the dive bars and the buckled sidewalks and the charm of my 1930s apartment with its old Murphy bed and clawfoot tub. Didion writes that she is not sure of the moment New York began to sour for her. I can say almost certainly that only my first year in the Midwest was unqualifiedly good, untouched by the long, slow decline that characterized the later seasons. There were bright moments always: I spent weekends in idyllic cabins and made pickles and played bocce near city lakes. I, too, had historic experiences in bars—I watched the 2008 election results come in in a bar on Lyndale Avenue, watched young people flood out into the streets and felt for a moment that the world was significant and somehow more real than it had been only minutes before. I didn’t cry in laundromats and I avoided parties almost as a rule, but for a long time, like Didion, I “cherished the loneliness of it, the sense that at any given time no one need know where I was or what I was doing.” I suppose the solitude ought to have been a sign. And slowly, it became one. People I cared about began to move away from the Midwest, moved on to New York, San Francisco, Washington D.C.—places I visited and found intoxicating in their pace and vibrancy. People in those cities didn’t watch as much television or read as many books; they were really living life! Meanwhile the intolerable Minnesota winters grew even more intolerable, and the summers somehow worse, brutally hot and plagued with unspeakable numbers of insects (and the particularly Midwestern pressure to always be enjoying the summer). I wrote to friends in other cities and began to find Minneapolis’s charm slipping, its provincial face showing. I could no longer write, Come out, and we’ll go to the state fair. I didn’t want to go to the fair. A mirage vanishes, is the thing; the way you imagine a place and the story you tell yourself about your life there slowly give way to the drudgery of everyday perception. In July, my final month in Minnesota, it was so humid that mushrooms began growing in a corner of my bathroom, and none of the doors of my apartment would open or shut properly, they were so bloated with the moisture in the air. I came home one oppressive afternoon and found two men drunk on Listerine passed out on the front lawn. I saw someone on the bus using needle-nosed pliers to remove his nostril hair. None of it was out of the ordinary, but my view of it was. Minneapolis hadn’t changed, but the ugliness had become all I saw of the city. It’s an act of great ego to write an echo of someone else’s work—or maybe it’s the humblest act of all. Didion herself was writing an echo, of Robert Graves’s autobiography on the topic of his postwar “bitter leave-taking of England,” where he had “ceased to care what anyone thought about [him].” Didion’s material feels both particular and universal because of this fact of tribute—no one could have written the piece but her, except that someone already did. She leaves this fact to the reader to know or uncover. Does that omission mean a reader should compare (or can’t avoid comparing) the parallel pieces? To me, the act of unacknowledged echoing suggests both equivalence and abasement: I am the equal; I will never be the equal. I’ve taken the coward’s way out by writing about Didion directly, here. If I were braver—and oh, if I were braver!—I would have let the reference go unmentioned. I’ll end true to form. See how Didion begins her final paragraph: “it was three years ago [my husband] told me that, and we have lived in Los Angeles since.” There’s an abruptness here—there’s the barest suggestion of that false hope, that you can escape what hounds you by running away fast enough, or cleverly enough, or suddenly enough. Never mind what comes next; never mind what a little research will actually tell us about Didion’s later years. Never mind all that. Instead, look at the now. There is a complex power to this type of ending, this fleeting perpetuity. Now: I am writing this in a café not far from Dolores Park, in San Francisco. Now: I’ve lived in California for two months. The wonder of everything isn’t lost on me yet; a palm tree, for example, is a very good thing. As a friend explained, “It means you’re somewhere new.” I did do one brave thing. I’m somewhere new.